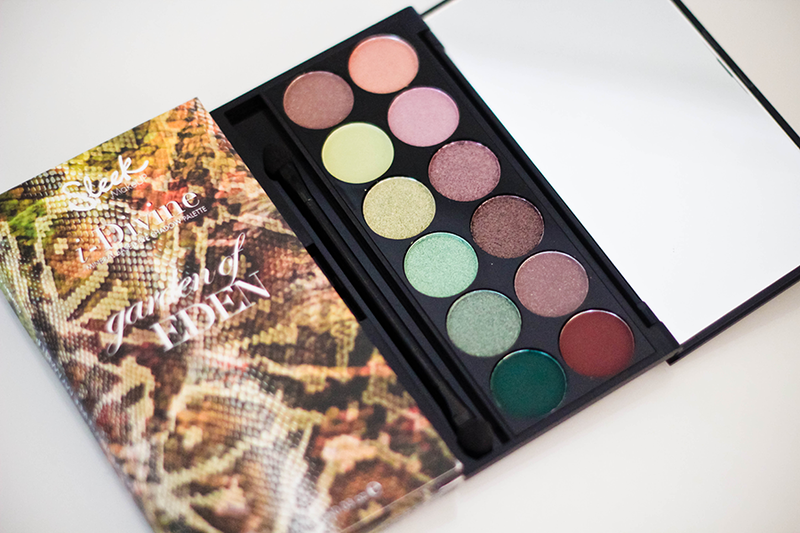 The newest palette to come from Sleek MakeUP this year is Garden of Eden i-Divine palette. Inspired by the earth & nature it has a lot of tones that are just that. Dusky purples, organic greens and earthy browns. It was quite nice to not see any blacks or white it's been kept true to the Earth. I've swatched the top and bottom rows of the palette. Gates of Eden - (not sure why in the palette above it comes off peachy) a warm almost copper gold. Forbidden - More shimmer based, not great pay off and it's a light taupe mixed with flecks of gold. A slightly lilac brown based tone. Entwined - Taupe brown, I would of said a bit more grey in some lights. It has flecks of gold shimmer running through. Adam's Apple - Light apple green, not great pay off, matte & quite chalky. Evergreen - Metallic finish, reminds me of a lighted shade of a mantis. Fauna - Another metallic finish, its a striking green. Tree of Life - I would call this forest green, it's dark and reminds me of a healthy tree leaf. The mattes within this palette aren't good - at all, too chalky and not enough pay off. The more metallic shades are highly pigmented and workable. I've notice it also can depend on the primer I use also as some primers bring out the colours more than others. This is available from the 15th January in selected boots and superdrug stores and online. Desperately want to get my mitts on this! The top row is divine... very naked 3 i thinks?